Once again I am borrowing a design from Let Them Have Polish. I saw these colors on her blog and HAD to have them. Thanks to Amazon I got them at a great price with free shipping!! This was also my first sponging, which is such as easy way to amp up your nails. 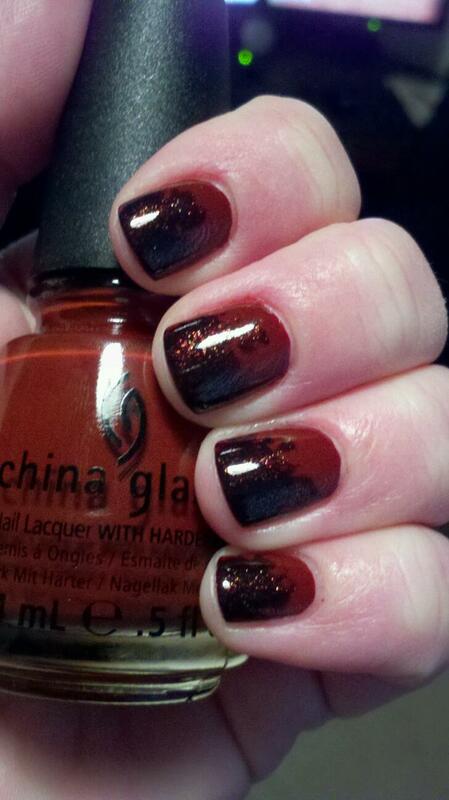 The base color is China Glaze Brownstone and I sponged China Glaze Midtown Magic on the tips. Brownstone only took 2 coats for perfect color and Midtown Magic only took 1 coat. Midtown has a coppery glitter that matched perfectly with Brownstone.